Tis the season of advent calendars, and the latest craze is to fill them with booze. Now, I’ve not actually got one – I do work for a drinks company in direct competition with the folks who make the calendars, after all – but everyone else with a whisky blog does and I feel left out. So, I’m going to write about a different whisky every day in advent, and as I don’t have an actual calendar, my whiskies should be different to everyone else’s. Here’s the first: Amrut Single Pedro Ximénez Cask #2697. I first tried this back at Maltstock in 2013, at an excellent class led by Ashok “I’m really not James Bond” Chokalingham, Amrut’s excellent brand ambassador and all-round nice chap. He dropped this and some other single casks into his tasting as a sneak preview, and despite them appearing on the market back then, there are still a few bottles left. Fortunately, I had one to hand, and decided that this would be the first of my advent whiskies. Nose: An intense sweet and savoury sherry cask assault. It’s the classics: sticky raisins, roasted meat, marzipan and cherries (Cherry Bakewells, without the royal icing), nutmeg, cinnamon and a hint of liquorice. However, there’s more to it than that, with buttery frosting, fruit jelly, green leaves and behind it all, some stewed rhubarb – sweet, sour and very fruity. Palate: Initially very grainy – a punch of freshly crushed barley and rolled oats – which is a shock after the nose. However, the sherry doesn’t sit in the wings for long, and rich wine notes and layers of tingling spice quickly roll in. It’s got a lot of bitter barrel char notes, but they are carefully balanced by dried fruit, bittersweet dark chocolate and a background of sweet and sour red berries. Finish: Liquorice and blackcurrant jam, fading away to leave a leafy, mint choc chip end. This is, as you might expect from an Amrut whisky aged in an active PX cask, it’s a bit over the top and very intense – it’s only four years old, but the cask lost 39% of its volume in that time. However, as a first dram of advent, with the remains of Storm Clodagh blowing around outside, it felt appropriate. Silly, sherried and full of fruit – some from the cask and some from the spirit. A good start to the month. 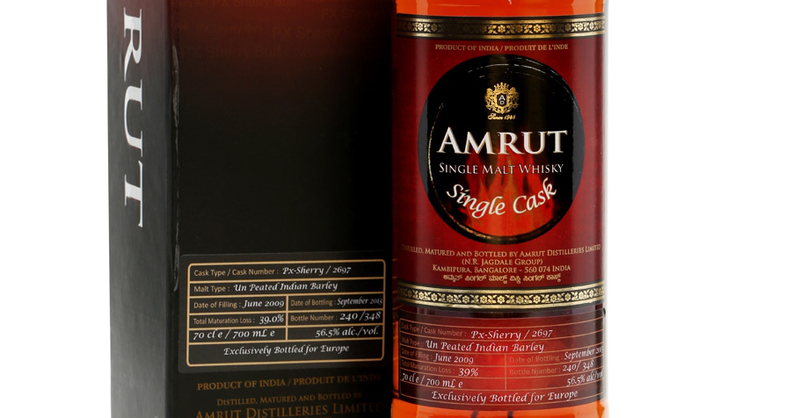 Amrut 2009 PX Sherry Single Cask #2697. Bottled September 2013. Indian Single Malt Whisky, 56.5% ABV. ~£90. Exclusively available in Europe. @cowfish Good idea, might join you in that! Ben Sherry liked this on Facebook. Tom Thomson liked this on Facebook. Andrew Purslow liked this on Facebook. Colin Campbell liked this on Facebook. Lora Hemy liked this on Facebook. James Childs liked this on Facebook. Jason Johnstone-Yellin liked this on Facebook. Alan Jessup-Peacock liked this on Facebook. It’s a good product, whether you pay for it or not – me not being able to write about it is just a good excuse for me to actually do some writing on my blog for once. Tobias Gorn liked this on Facebook. Oliver Klimek liked this on Facebook. Yoav Gelbfish liked this on Facebook. Emma Ware liked this on Facebook. Peta Thames liked this on Facebook. Joshua Gershon Feldman liked this on Facebook.